At around the same time the Richemont Group-led SIHH fair is happening in Geneva, four watchmaking brands from LVMH also host their own event in the city called Geneva Days. 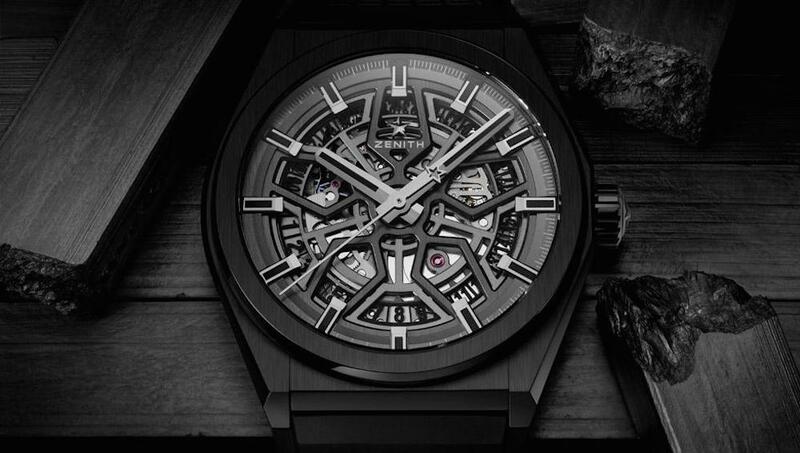 Read on to find out what Hublot, Zenith, TAG Heuer, and Bulgari annouced at Geneva Days 2019. In 2000, Bulgari purchased the Gerald Genta brand. As many of you already probably know, the late Gerald Genta is one of the most celebrated watch designers in horology. He was responsible for designing watch icons like the Audemars Piguet Royal Oak, the Patek Philippe Nautilus, and the Bulgari Bulgari watch. So to celebrate the 50th anniversary of the founding of Gérald Genta in 1969, Bulgari released the Gérald Genta 50th Anniversary Watch. 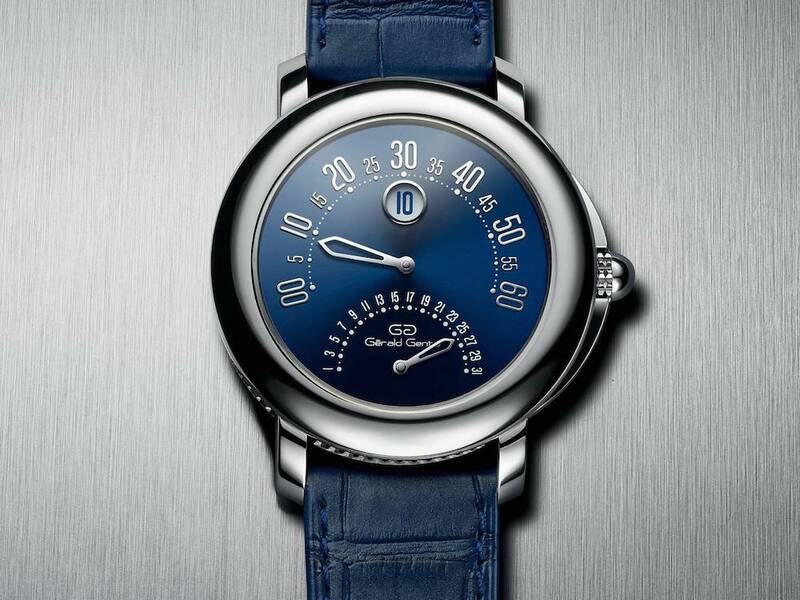 Clearly inspired by Gérald Genta Arena Bi-Retro watches of the past, the Bulgari Gérald Genta 50th Anniversary Watch features a 41 mm platinum case, a vibrant blue dial, and matching blue alligator strap. The dial houses the jumping hours window, retrograde minutes, and retrograde date displays, complete with the Gerald Genta logo. 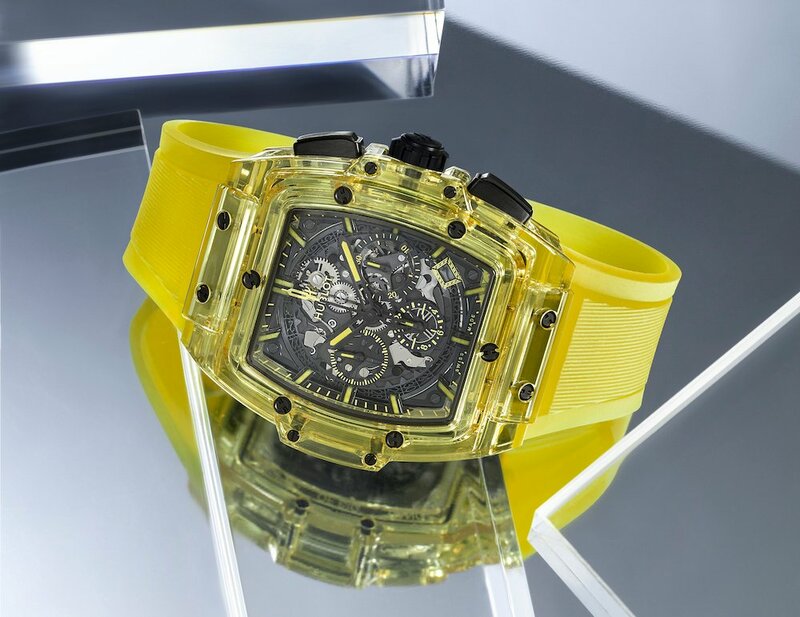 In its continued quest to master the sapphire watch case, Hublot unveiled the new Spirit of the Big Bang Yellow Sapphire at Geneva Days 2019. Featuring a 42 mm tonneau shaped case, the new sunny Hublot chronograph is both colorful and transparent. Visible from skeletonized dial (with plenty of yellow accents) is the self-winding skeleton chronograph movement, based on the legendary Zenith El Primero caliber. The Spirit of the Big Bang Yellow Sapphire is fitted with a matching yellow rubber strap and it is limited to 100 pieces. 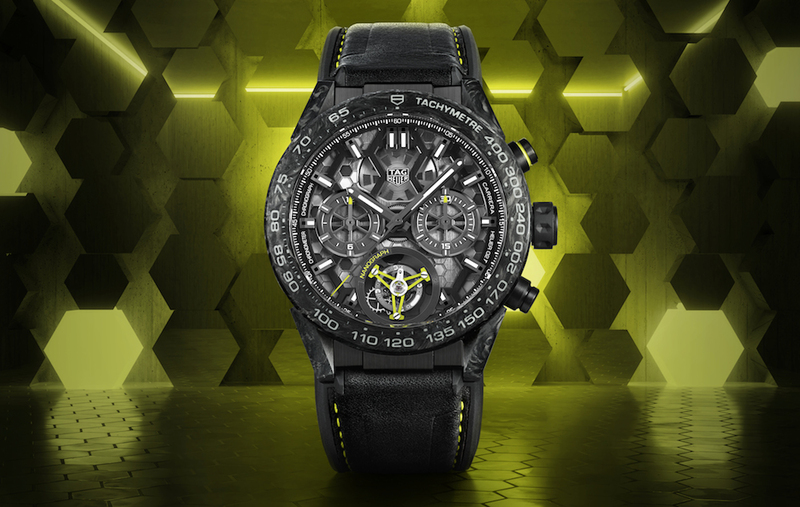 While the 45 mm black PVD titanium case and carbon bezel of the new TAG Heuer Carrera Calibre Heuer 02T Tourbillon Nanograph are certainly eye-catching, the big news about the watch is found on the inside–the world’s first carbon-composite hairspring. Invented, patented, and produced by TAG Heuer, the carbon-composite hairspring apparently improves the movement’s performance thanks to its shock resistance, antimagnetic properties, and its hexagonal-shape provides “perfect concentric oscillations” for better precision. As a tribute to the hexagonal pattern of the hairspring’s carbon-composite material, the open-worked dial of the Carrera Calibre Heuer 02T Tourbillon Nanograph features sandblasted and fine-brushed hexagons on the visible movement plate. 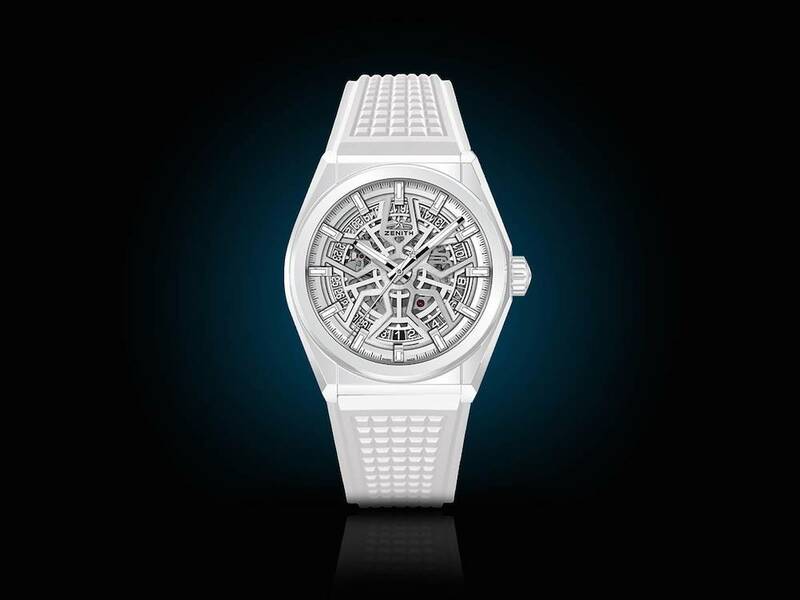 For 2019, Zenith is offering the Defy Classic watch in ceramic–a first for this Zenith watch. Available in blue, black, and white ceramic, the new Zenith Defy Classic cases measure 41 mm in diameter and sport a mix of polished and satin-brushed finishes. The skeletonized dial and sapphire caseback give us a window into the in-house Zenith Elite 670 movement, which has been restructured to be open-worked–yet another first. Although the history of the Zenith Defy collection stretches back to the 1970s, this trio of new models flaunts a modern approach indeed. Attached to the ceramic cases of the watches are sporty rubber straps in matching colors.